“Supercalifragilistexpialidocious”, “Practically perfect in every way”, “Wonderful”. All these words could be used to describe the character of Mary Poppins as well as her feature debut back in 1964 (She used to be a character in P. L. Travers’ series of books). Her return in this sequel is just as glorious and spectacular. Though, this time, Emily Blunt dons the uniform that Julie Andrews wore, as well as that chipper English delivery she won the Academy Award for. 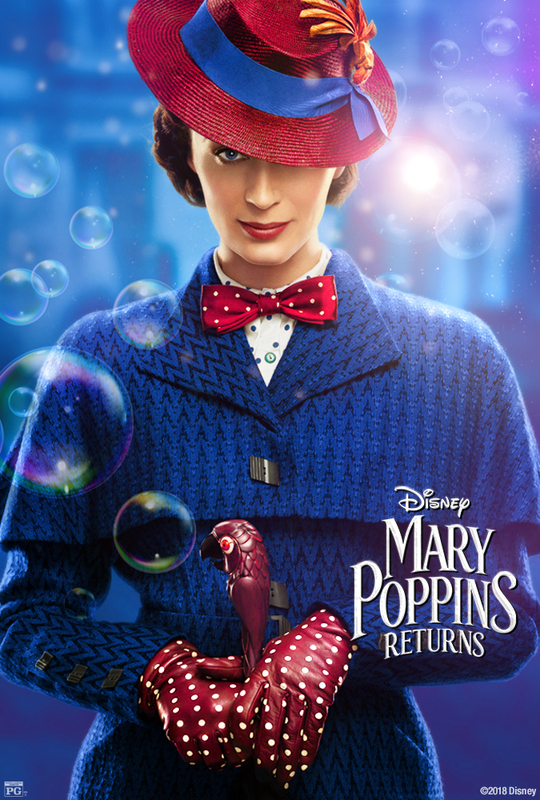 While time will tell if ‘Mary Poppins Returns’ gets nominated for a majority of Oscars, as far as I am concerned, I enjoyed this movie and will call it “delightful”. Despite being made fifty-four years after the first ‘Mary Poppins’ was released, ‘Returns’ is set twenty-five years later. Jane and Michael Banks (Emily Mortimer and Ben Whishaw) are grown up, with Michael, a widower, raising three children of his own; Annabel (Pixie Davis), John (Nathanael Saleh), and Georgie (Joel Dawson), with help from Jane, and Michael’s housekeeper Ellen (Julie Walters). Though Michael is facing more than just a family to raise, he is dealing with some financial trouble leading to him having to file for bankruptcy, unless he gets shares that his late father George left him. Who better than Mary Poppins to save the day, and bring some fun, life lessons, and a little magic to make the family live happily ever after? As Poppins, Blunt captures the charm that made Andrews’ portrayal so beloved by many, and proves that she is one of the greatest actresses in modern cinema. Joining Blunt is Lin-Manuel Miranda as Jack, a lamplighter who used to be one of the children Poppins was a nanny for, and one who could pass as the next Bert, Colin Firth as Michael’s conniving boss, and Blunt’s ‘Into the Woods’ co-star Meryl Streep as Poppins’ cousin who lives her life literally upside-down. A lot of fun is to be had with ‘Mary Poppins Returns’. The musical numbers are dazzling and epic, the performances are quite charming, and the movie itself is warm and magical. With all these reboots, remakes, and sequels, it seems that Disney still has a little magic left for anyone young and old. How did her singing work? Julie Andrews had one of the best voices in the history of the business. She did a really great job. Not to mention, that this is not her first musical.